Your customers are going to give you three seconds to make the sale. Do you know what to say in those three seconds? The marketing methods of the past are losing effectiveness as consumers are getting smarter and smarter and have less and less time. What is needed is a new way of doing business-a method that is simultaneously socially responsible and far more effective than “old marketing.” This new way is The Irresistible Offer. When Domino’s Pizza gave their customers an offer they couldn’t refuse-“thirty minutes or less” or the pizza was free–Domino’s grew from a single store to a $4 billion chain. New Marketing guru, Mark Joyner defines and explains this revolutionary selling philosophy and helps you apply it to your own business. He examines the elements that make up The Irresistible Offer and presents a formula for creating one of your own and tools to help you estimate the effectiveness of your offer in advance. The clock is ticking. Don’t manipulate your customer. 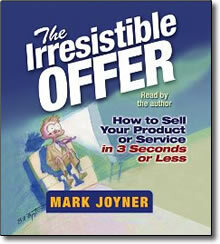 Manipulate your offer instead-so customers find it, and your company truly irresistible!